8:15-9:15am—Torch Run: El ARCA in Lincoln Heights: 3839 Selig Pl, L.A. 90031. 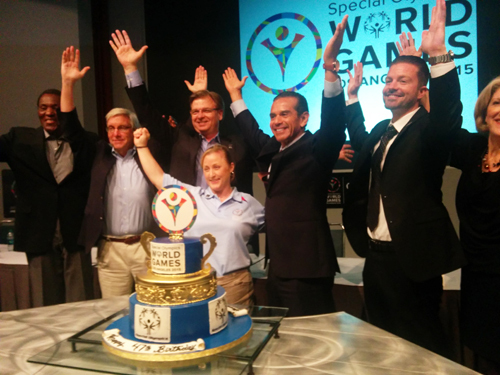 Join Councilman Gil Cedillo, Special Olympic athletes and Hollenbeck Police officers for a special ceremony welcoming the World Games to L.A.
11am—Torch Run: Mariachi Plaza/Metro Gold Line Station in Boyle Heights: 1825 E. 1st St. LA 90033. Councilman Jose Huizar and other officials to take part in Torch Run ceremony that starts at 12:15 p.m.
1:30-4:30—Monterey Park Host City Welcome to German Delegates: Free arts & music festival at Barnes Park Amphitheater as part of Monterey Parks Host Town activates. Park is located at 350 S. McPherrin Ave, Monterey Park, CA, 91754. For more info, call (626) 307-1388. 11am-12pm—Torch Run: Los Angeles City Hall: 200 N. Spring St, LA 90012. Ceremony welcoming the Flame of Hope and Special Olympic Athletes to the city of the Angels. 11am: Pep Rally at Cal State LA. Join host town Lincoln Heights, Monterey Park and & Alhambra for rousing farewell to the Special Olympics German delegation. Band performances, cheerleaders and more. Location: CSULA Gymnasium. 12:10-1:10—Torch Run: Los Angeles County Hall of Justice: 211 W. Temple St, LA 90012. One of the final stops along the route to L.A. Memorial Coliseum for the official lighting of the Olympic Torch during the 2015 World Games Opening Ceremony.